Now Apple is in close partnership with IBM (2014), CISCO (2015), and SAP (2016). In 2014 Apple and IBM announced an exclusive partnership aiming to redefine the way work will get done, address key industry mobility challenges and spark true mobile-led business change. With IBM’s unparalleled industry expertise, businesses can take the first step in empowering their workforce through mobile technology. These apps, exclusively for iPhone, iPad, and Apple Watch, give enterprises a simple way to solve workflow and role-specific challenges, while transforming industries from the ground up. The Indian government doesn’t allow the import of refurbished iPhones. The main reason for not granting the application is that it will confront the, ’Make in India’ initiative and burden the country with electronic waste. China’s government is always good for surprises. Apple finds itself in new heat with Chinese regulators. News surfaced that its iBooks Store and iTunes Movies services were suspended in the country at the request of government regulators. The services opened in the country just six months ago, with the blessing of the authorities. 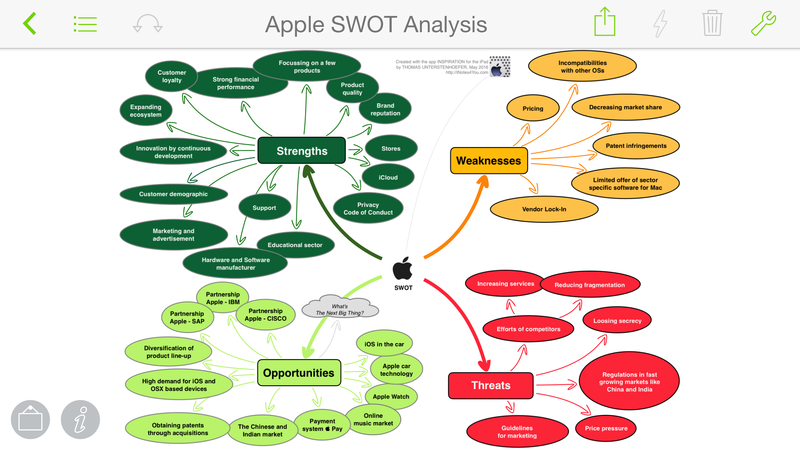 A SWOT analysis is used to evaluate the Strengths, Weaknesses, Opportunities, and Threats in a business venture. It’s used in any decision-making situation when a desired end-state has been defined. SWOTs may look completely different if created from external or involved people.